One of the biggest challenges facing students of Greek (and I have in mind primarily students of NT Greek in seminaries) is retaining even a fraction of the information that is heaped upon them in first- and second-year Greek classes (and beyond). This is a very real struggle and I would venture that many students probably lose most of what they “learned” soon after the class is over. While we could lay most of this blame at the feet of those who rigidly adhere to impractical and ineffective pedagogies, the fact remains that language that isn’t used regularly will be lost, regardless of the method by which it was attained. Hendrickson has provided students with yet another tool to aid them in their quest for Greek retention, what I will call the “two minute” series—Keep Up Your Biblical Greek in Two Minutes a Day: 365 Selections for Easy Review. The premise is right there in the title—spend a minimum of two minutes every day reading through the selections and you’ll improve your vocabulary base and thereby improve your ability to read the Greek NT. Ἀποκριθεὶς δὲ Ἰωάννης εἶπεν· ἐπιστάτα, εἴδομέν τινα ἐν τῷ ὀνόματί σου ἐκβάλλοντα δαιμόνια καὶ ἐκωλύομεν αὐτόν, ὅτι οὐκ ἀκολουθεῖ μεθ᾽ ἡμῶν. I think what I like most about this series is its simplicity—it’s easier to drink from a fountain than a fire hose. Each day’s selection provides a minimal amount of Greek to focus on, thus allowing a slow immersion into the pool rather than diving from a cliff. The downside, of course, is that if you limit yourself to one page per day, your rate of retention will correspond. However, you don’t have to do one day at a time (sweet Jesus!). The corresponding calendar days are meant as a guide, to help you keep up with readings in a systematic manner. The selections vary in length and difficulty, so there’s no gradation. You could easily find a difficult verse/clause in the first third of the book as you could the last. So, overall, I think this is a useful tool to help readers of the GNT shore up their skills that may have waned. There are a couple of elements, however, that I don’t care for, and they are elements that I spurn when found in any work. The first is the use of transliteration for Greek terms. Perhaps they’re included to aid in pronunciation—the author doesn’t say—but I find them to be an unnecessary addition to any work. Knowing how to pronounce a word is important, but if you can’t read and pronounce the Greek text, then exegesis is still far in your future. Knowing how to pronounce a word is barely the beginning of understanding and unpacking all of the information encoded in a word/phrase/clause and I view transliterations as ultimately unhelpful. The other primary negative I would point out is the use of Strong’s numbering system. If you’re beholden to Strong’s, then obviously this will help you. However, the pitfalls of relying on Strong’s have been long discussed in the biblical studies community and I have personally avoided using it since, well, long ago. I’m always surprised that Strong’s still shows up in modern works. I’m willing to assume, as I mentioned, that its inclusion here is to provide a component many users may be comfortable with, so it’s not a deal breaker by any stretch and it doesn’t really detract from the book’s/series’ usefulness. If you have an aversion to Strong’s, do as I do—ignore it. Is the Two Minutes series a magic bullet that will propel you to new-found heights of retention? Certainly not. What it will help you do, should you use it regularly, is help you regain your handle on NT Greek and, hopefully, push you to deeper, more advanced studies. 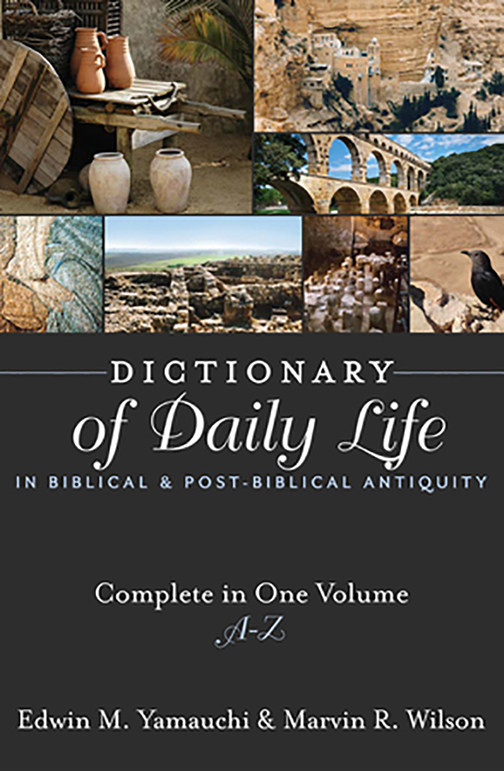 A couple of years ago, the good folks at Hendrickson published a multi-volume work entitled Dictionary of Daily Life in Biblical & Post-biblical Antiquity (hereafter DDL), volume two of which I reviewed here. After what seems to be a warm reception of the series, Hendrickson published the previously separate volumes in a one-volume edition, a decision I (for one) am glad they made. Having reviewed only one of the previous volumes, I couldn’t speak for the whole series (though I’m sure each one had its strong and weak points). However, this all-in-one edition has allowed me to read through a broader selection of topics (even though each volume covered numerous topics) with a slightly better sense of the contents. Given my own proclivities towards background studies, this series was a welcome one. Indeed, I felt it would be a welcome addition to the already burgeoning body of literature available. However, this particular work fills a niche that is part of the world of backgrounds, but still deserves its own treatment. As editor Edwin Yamauchi notes, “the Bible, as received, recounts events in the lives of individuals, tribes, and nations…” (emphasis mine; xii). It is this aspect of background studies that has recently grabbed my attention and this volume provides a wealth of information on various aspects of every-day life, many of which receive only scant attention in other comparable works. As I noted in my previous review, the primary way in which this series differs from others is its focus—on the daily life of the peoples of antiquity. So, while matters that are pertinent to the bigger picture of the biblical story may still show up, they are only addressed as sub points, so to speak. In other words, they are only mentioned as connections to the primary socio-cultural feature the article is about. However, these matters of connection to larger themes of the biblical story are by comparison minimal and quite brief. There are no lengthy discussions of religion, temples, sacrifice, etc. If such issues do show up, it’s only minimally. And I would also like to note that the length of discussion for many topics is somewhat related to the relevance of that topic to the various contexts in which it relates to the biblical text (these contexts will be mentioned below). For example, the article on milk and milk products (1193–1207) offers but a single paragraph about milk and milk products in the NT. Why? Because the term “milk” (γάλα) simply doesn’t occur that frequently and most of the uses are figurative in some way. The articles are written by experts in their fields but are written in very accessible prose so that the reader might receive the maximum benefit. Each topic is discussed in overarching contexts—scriptural (Old and New Testaments), which is followed by the cultural (Near Eastern, Greco-Roman, Jewish, and Christian)—thus providing the reader with a wider range of backgrounds against which to understand that particular issue. Within each of these sections there is brief discussion relevant to other sub-contexts, e.g., political, socio-economic, religious, etc. For example, in the section on barbers and beards (sure to appeal to the hipsters among us! ), Marvin Wilson discusses the matter in the above-mentioned larger contexts (scriptural and cultural), but conveys how haircuts and beard cutting/shaving were important socially and religiously, information that is not always obvious when reading texts, especially in isolation from these assumed contexts. While each topic is addressed at generally similar lengths, some obviously will be shorter/longer than others. And for those who wish to read beyond the DDL, each article concludes with a substantive up-to-date bibliography. One feature that I appreciate in this volume is the fact that the authors took the time to include, at least, parenthetical references to the ancient works they cite. It seems a given that any work that like should require its contributors to do this, but there are surely occasions in which editorial constraints prevent the inclusion of copious references and notes. While there are no notes to speak of here, the reader does have references to primary sources, the consistency of which is dependent on the particular contributor. Also, the references, likely due to the aforementioned restrictions, are not numerous, but do provide a starting point of sorts. More technical series (ABD, IVP’S black dictionaries) offer insight into all aspects of the biblical world, particularly those issues that were more pervasive socially, e.g., imperial cult, agriculture, religious praxis, etc. The DDL, however, places the focus on aspects of life that were perhaps not central to the texts that reflected the culture. Ed Yamauchi, who both edited and contributed to this series, cites the issue of abortion as but one example of a practice that was pervasive in the ancient Mediterranean, yet is not addressed in the Bible (1). This particular volume covers such matters as dentistry and teeth, doors and keys, food consumption, heating and lighting, and horses, along with a number of other aspects of daily like that are perhaps more expected. As Yamauchi correctly points out, the authors of the Bible took for granted what was well known to themselves and their audience, thus they had no need to provide all the requisite background information to understand what they were reporting (1). As such, we must comb the sources of the ancient world in order to understand their world and thus better understand the context of the Bible. However, outside of academia, most readers of the bible have neither the resources nor the skills to mine the depths of ancient sources, so works like DDL demonstrate their ultimate value. There is really nothing to dislike about this series, save for the use of transliterated terms from the languages of the sources cited and otherwise noted. This negligible element aside, the DDL is a solid work, one that will benefit both scholars and non-academics alike. It goes without saying (but I’ll say it anyway) that no, it is improbable that anyone reading these volumes won’t find something they disagree with. However, this volume is well researched and lucidly written, so even in disagreement readers will learn with great benefit. Will this volume replace others? No, and it isn’t meant to—it’s a supplement to previous works that will greatly aid in the study of the world of the Bible. Many thanks to the kind folks at Hendrickson for this review copy! As I noted in my review of the UBS5, I have always preferred the UBS over the Nestle-Aland, and it usually comes down to one aspect—aesthetics. The UBS text is simply more readable and looks better on the page. The font choice and the less detailed critical apparatus yield a less cluttered page, which leads to a better overall reading experience. However, despite my preference of one over the other, these volumes aren’t exactly ideal for just reading, though it certainly can be done and certainly less a chore than reading volumes in Loeb Classical Library. They’re a tad small and for those who are dependent on ocular assistance, it’s more of a effort to read beyond a passage or two. Enter the heaven-sent concept of a reader’s edition! The idea behind such works is, of course, to facilitate regular reading of the GNT. The reader’s edition assists readers to this end by providing the text and a running dictionary below to aid the process of reading. Rather than stopping and having to consult a lexicon, most of the unfamiliar words are listed below. For this volume (as is probably standard), all words occurring fewer than thirty times are listed at the bottom of the page. Each entry consists simply of the lexical form of the word, its parsing (for verbs), and a gloss. Readers should know, if they don’t already, that the provided glosses are editorial choices and do not necessarily preclude other connotations. One example (of many that would likely be arguable to any given reader) of a gloss that is less helpful than could be is found in Acts 2:22. Jesus was ἀποδεδειγμένον, which is glossed as “commend” in the dictionary. While this is certainly a possible meaning and not necessarily wrong here, it is an editorial choice that perhaps would have been better rendered “display” or “set forth.” Again, “commend” isn’t wrong, but better choices (I think) are available. Unfortunately, I do not own a copy of the first edition of the UBS Reader’s Edition against which to compare this current edition. However, I can unequivocally say that this is a splendid volume and will certainly become my go-to edition for reading the Greek text of NT. I have been using Zondervan’s Reader’s Greek New Testament for several years now and have enjoyed it, but it is safe to say it will spend considerably more time on the shelf now that I have the UBS reader. Why? There are two primary reasons. First, the GNT-RE’s running dictionary is formatted in two columns, unlike Zondervan’s edition, which runs left to right in an ordinary linear fashion. The UBS layout is much better for dropping down to find the word in question. Second, the GNT-RE’s paper is only slightly thicker, but enough that it more effectively prevents ghosting so as not to be distracting, noticeably more so than the Zondervan edition. One thing I do when reading bibles to mitigate some of the ghosting effect is to place a dark colored piece of paper behind the page I’m reading, which effectively eliminates the effect altogether. This is especially true with the GNT-RE. There are a few more notable features to mention. For one, idiomatic word combinations are defined. For example, in Acts 1:12, the disciples are returning to Jerusalem from the Mount of Olives and Luke tells us that the distance from the mountain to Jerusalem is σαββάτου ἔχον ὁδόν. The UBS-RE translates this idiom in the dictionary “a Sabbath day’s journey = about half a mile or 900 m”. These small measures help achieve the desired goal of facilitating a good reading experience. Though this is not a critical text, there is a small apparatus for the more significant variants for those who may be interested in a brief brainstorm concerning a particular word choice. That being said, there are many pages on which there are no variants listed, so the t-c element is decidedly minimal. Other minor features include OT references in the margins (always helpful! ), an appendix that defines words used more than thirty times, and a few nicely colored maps. This volume is also noticeably larger than the UBS/NA texts. Those volumes are approximately 7.5 x 5.5, whereas the GNT-RE is approximately 9.7 x 6.4, which is closer to the average size of a regular book. All this is bound in black flexisoft, which is softer to the touch than the standard binding and also looks quite nice. In sum, this is a splendid and well-designed volume. I’d be interested in knowing how this edition has changed from the first, other than including the updated UBS5 text, so perhaps I’ll find a used copy somewhere, if only to have a means of comparison. Whatever the other changes from the first edition to the second, this is a wonderful volume that every reader of the GNT should have.